Joshua Tree is home to Murtle the Turtle, or sometimes to those who spell her name wrong, Myrtle the Turtle. Murtle is a giant statue located on Twenty Nine Palms Highway that is the world's largest desert tortoise. She is a remembrance from back when Joshua Tree had turtle races, and for some reason parades to celebrate said turtle races. 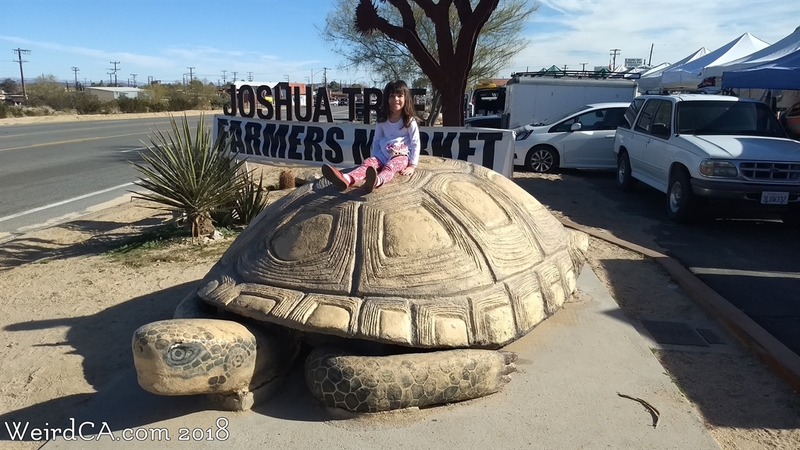 Murtle began as a float on wheels, way back in 1957, that after the parade, was donated to the Joshua Tree Chamber of Commerce. Since the turtle races utilized mostly the desert tortoise, a now protected species, the races in their former format can no longer occur. Murtle, as the plaque next to her spells her name, lives on Turtle Island. A metal sign spelling out "Joshua Tree" sits to the left, along with a metal Joshua Tree, one of the plants the area is known for. Many people misspell her name as "Myrtle", and although called a turtle, she is in fact a tortoise. Tortoises live on land, while turtles live some or all of their time in the water, of which there is little to none around Joshua Tree. Turtle Island sits on the south side of the highway, between Sunset Road and Hillside Road, in front of a small strip mall. They occasionally have farmers markets there. Murtle began her life as a wire and wood frame with plaster and cement covering. She is now a large sculpture, made out of concrete, that is proud to be the world's largest tortoise. She clocks in at about four feet tall and ten feet long. Although if you could figure out the significance of what these plaques mean for Murtle, I would love to know. I'm not sure what info you already have accumulated for our famed tortoise here in JT, but here's some stuff to help complete the article: * Located on Hwy 62 (aka 29 Palms Hwy) on the right side when heading eastbound (towards 29 Palms); it's in a very small "strip mall" (several buildings with 3 - 5 stores/offices attached) appropriately referred to as "Turtle Island", even though Myrtle's a tortoise!